The name of Sir Abe Bailey (1864-1940) is associated with the Centre for Conflict Resolution (CCR),that was launched at the University of Cape Town in 1968, as well as the Bailey Bursary. Both the Abe Bailey Trust and the Bursary were established in terms of the Will of Sir Abe Bailey who died in 1940. Abe Bailey was born in Cradock, South Africa, in 1864 and came from a modest background. By 1894, he had become the head of the Bailey Group of gold mines and also one of the co-owners of the Rand Daily Mail from 1902. He left behind a rich legacy for the country of his birth. When asked to account for his success in later years, Bailey often employed two of his most famous maxims: 'The stock exchange is like a cold bath, get in and get out quicky!' and: 'buy when everyone wants to sell, and sell when everyone wants to buy!' Bailey is reputed to have said that it was not so much in gold that he made his greatest gambles, but in horses. Without any reservation or modesty, he would boast that he backed his own racehorse, Lovematch, to win the largest sum of money ever won in those days. Sir Abe Bailey died in Muizenberg on 10 August 1940 and lies buried on the hillside above his former home. Here, a memorial has been erected on ground given to the Bailey Trust by the Government. The Bailey Bequest numbers almost 400 paintings and works on paper including prints drawings and engravings. These works are held in trust for the South African people at the Iziko South African National Gallery. This is a valued collection of predominately British Portraits and includes one of the greatest collection of Sporting art outside, produced during the perious 1750-1850. The valued collection includes important British artists such as Thomas Gainsborough, George Romney, Henry Raeburn, Sir Joshua Reynolds PRA, Sir Thomas Lawrence PRA and J.M.W. Turner. The Bequest also holds paintings by 17th century Dutch masters such as Mattheus Wijtmans and Josef Israels and French Masters such as Gaspard Dughet, and Ernest Messionier. Exhibitions are curated regularly, showing a range of carefully selected works from the Bequest, sometimes in conjunction with works from the Permanent Collection of the SA National Gallery. A digitial monitor, generously developed by the Trust allows visitors to view the entire collection. The Bailey Trust generously supports ongoing conservation work on the Bailey Collection, and the condition of the collection has improved markedly over the past two decades. The Iziko South African National Gallery has a wholistic approach to 'preventive conservation' where collection care, including all aspects of environmental control which play an important role for the long term preservation of its collections. This includes best practice for the storage, handing and display of works of art. Individual treatments are carried out on works in the collection and both photographic and written documentation of this is an ongoing process. For further infomation, explore this website. Matthys Bokhorst. 1970: British Sporting Paintings and Drawings in the Abe Bailey Collection of the South African National Gallery, Cape Town. South African National Gallery/Sotheby's, London (black and white, 53 pages). Anna Tietze. 2001. The Sir Abe Bailey Bequest: A Reappraisal South African National Gallery (24 pages, colour). Anna Tietze. 2008.The Abe Bailey Collection in the South African National Gallery. Bailey Trust/Iziko SA National Gallery (151 pages, colour). We invite Art educators to visit the SA National Gallery and Annexe. Workshops and visits can be tailored and designed to suit your specific needs and dovetail with the curriculum. We are able to accommodate learners from grades R through to 12 and are eager to reach learners with any level of exposure and ability in Art. 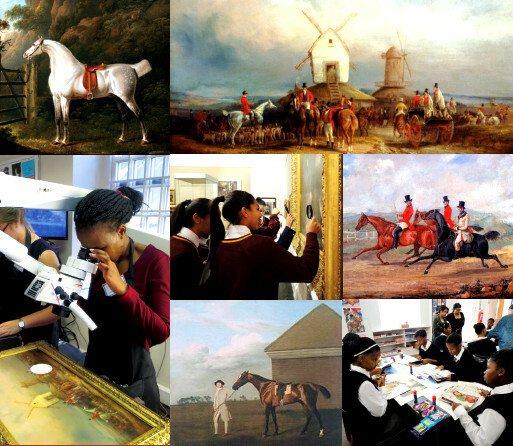 What we offer: We are able to do extensive walkabouts, introducing learners to different artworks and concepts. Learners can be provided with a worksheet (on request), which allows them to interact with the exhibitions independently. We are also able to provide a practical art activity for the learners to complete in the Annexe or Gallery depending on the numbers required. Both the worksheet and practical activity can be continued and completed in the classroom. The Iziko South African National Gallery became a concept when it was decided in October 1850 to establish a public space to exhibit art in Cape Town. On 10 May 1851 the first ever fine art exhibition took place in one of the school rooms in the Company's Gardens. By 1872 the national collection was established with a bequest of 45 paintings from Thomas Butterworth-Bayley, and three years later it was decided to find a site for storage and exhibition purposes. From the 1890s to 1930 the collection was housed at the SA Museum. A custom-designed building was envisaged but the foundation was only laid in 1914 and finally completed in 1930. The first artworks by South African artists were acquired in 1926. They were African Head, a bronze sculpture by the sculptor Anton van Wouw, and Adderley Street Flower-sellers, an oil by Neville Lewis. The Iziko South African National Gallery (ISANG) presently operates as one of a number of museums under the umbrella of Iziko Museums of South Africa. The mission of Iziko is to "present extensive art, social and natural history collections that reflect our diverse African heritage". Booked School Group: R5 (per learner), Unbooked School Group: R8 (per learner) Website: www.iziko.org.za For further information about the Trust and the Travel Bursary specifically, please visit www.abebailey.org The website also has some of the history of Sir Abe Bailey.